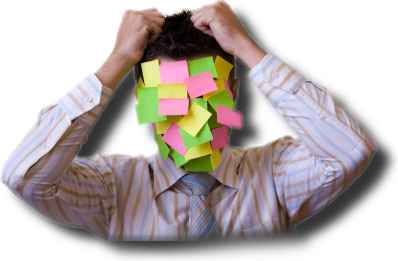 Number 1 Home Agent » Blog Archive » How Many Problems Can You Handle At The Same Time? How Many Problems Can You Handle At The Same Time? At any given time we all have a limit. That limit varies depending on a number of factors: the nature of the problems, the emotion tied to the problems, how far down into "seriousness" one is, even how well rested or hungry one is at the time. Bottom line, it becomes too much when there is more external push against self than there is left of self to push back. I’m really not interested in proselytizing but I ran across this little gem the other night and I saw so much potential for anyone who could understand it that I wanted to share it. The rationality of the mind depends upon an optimum reaction toward time. DEFINITION: Sanity, the computation of futures. DEFINITION: Neurotic, the computation of present time only. DEFINITION: Psychotic, computation only of past situations. So when a person is handling situations and problems quite well they have their attention mainly on the future. They are happily creating a future which they can clearly see – and they are making that future they see a reality. Down from that is the person who is "working in the present". This is usually thought of as good and very pro-survival but is factually in the neurotic category, not unlike a rat in a maze. Handling an escrow can fall into this category. One’s attention is thoroughly stuck in the present and they can not see much of a future, as handling now is such a struggle. Like an air traffic controller, they can not take their eyes off of the screen. Way down scale, stuck on the past, is the person who can not visualize a future or even really see much of the present. Fact is, we have all been – each and every one of us – in each of these three states with regard to different subjects at one time or another. I am reminded of a truly beautiful quote from Winston Churchill, "If you are going through hell, keep going." Where were you going before the excreta hit the rotor? What was it you wanted in the first place? Survival pertains only to the future. COROLLARY: Succumb pertains only to the present and past. If you can again see what it was you wanted – even if you can only see it dimly at first – keep looking there. What were your goals? What was it that seemed so delightful, that just thinking about it made you feel better? How would life be if you had that now? That is where to put your attention to get out of the mess. An individual is as happy as he can perceive survival potentials in the future. This entry was posted on Thursday, August 20th, 2009 at 1:38 am and is filed under The Realtor Success Series. You can follow any responses to this entry through the RSS 2.0 feed. Both comments and pings are currently closed.